Presidency logos are always worth a chuckle and the Swedish Presidency for the second half of 2009 is no exception. As was astutely pointed out to my on Twitter my Magnus Ljugkvist the logo of the Presidency (above right) bears a striking resemblance to the logo of Sony Ericsson (above left), the Swedish-Japanese mobile phone firm. Simply rotate the logo 90º anti-clockwise, apply some EU Swedish colours to it and, bingo! Daniel Bastiero on the other hand rather sees the influence of Obama on the logo (in Spanish). Euractiv has an article about the logo, quoting some of the usual Presidency-style bla bla about it, all openness and light etc., and also says it cost more than €100000 to design, and the work was done by Bacon Advertising. So who, I thought, are these folks? A Google search – in English or Swedish – reveals nothing at all, not even about Erik Kalmau, the guy that is supposed to have done the work. There is a 1 page site at bacon.se and I wonder if they are the same as Egg & Bacon Advertising? Bit strange to dish out €100k to a company that does not even have a basic internet presence and gets their inspiration from Sony Ericsson! 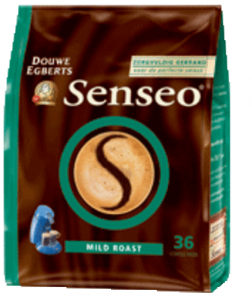 Thanks to a debate with @pstrempel, @mteu and @yvonnenasshoven on Twitter we’ve also discovered the logo looks rather like Senseo Coffee as well. I think the lesson here is that a smooth looking S is not a logo that is designed to stand out – just like the Presidency then. Low key, professional, and for sure not as garish as the Czechs! If the French state can’t do it, Ericsson can? Pingback: Maison de l’Europe de l’Eure » Brèves » La Présidence suédoise dévoile son logo! There’s also something a bit like Disney’s Aladdin to it, the smoke from Aladdin’s lamp? I thought this was already a good imitation of the new Pepsi logo, but Sony Ericsson matches even better!